Apparently, one of the things this show's known for is popularizing the term "Chrismukkah" through a series of annual specials. In case it's not obvious from the term, Chrismukkah is a fusion of Hanukkah and Christmas. 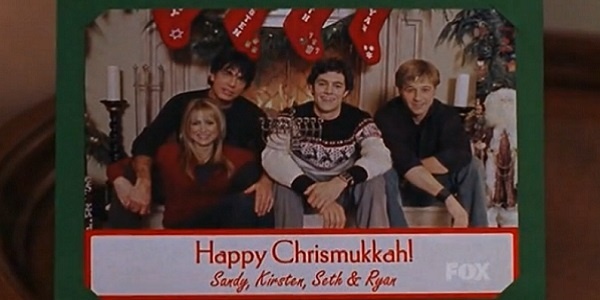 In the show, it's the favorite time of the year for Seth, one of the series's main characters. Playing up the fusion of two great things theme, he has a pair of girls competing for his affections. He ignores the advice of his foster brother, Ryan, and tries to juggle the burgeoning relationships. All of this is pretty awkward for most of the episode. The girls behave in a fairly cliche manner, trying to one-up and undermine each other, until the end, when they present Seth with their gifts. When they each see what the other did, they're simultaneously impressed with their rivals' initiative and embarrassed by their own behavior. A friendship is either saved or started, and - even before things officially dissolve with the self-obsessed Seth - it's clear he doesn't deserve either. An episode that started rank with misogynistic undertones delivers a fairly feminist resolution. Of course, this leaves Seth alone. But that's okay - he can spend time with his family, who had their own B and C plots going on. Ryan's relationship troubles concerned a girlfriend with a drinking problem. This story line felt quite a bit more formulaic, not to mention judgmental. 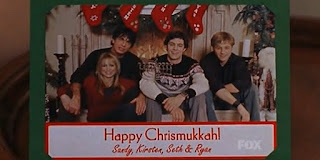 They did experience a Chrismukkah miracle late in the episode when a cop who'd pulled them over was called away seconds before he'd have discovered an open bottle of vodka. Meanwhile, the parents had some sort of side adventure involving the mother's greedy father, who was engaged in an underhanded business deal with her husband. This ended happily enough when she stumbled across proof her father was illegally withholding information. There's a lot more here, but - honestly - I don't care enough to try and explain it. The show had enough entertaining ideas and interesting characters to make it interesting, despite being focused on a group of people it's difficult to sympathize with, due to the fact they're pretty much all whiny rich people. I don't think this qualifies as "must see," but it was okay to watch, despite being cringe-inducing at times. The resolution to the double-date scenario absolves this of a lot of sins, though.